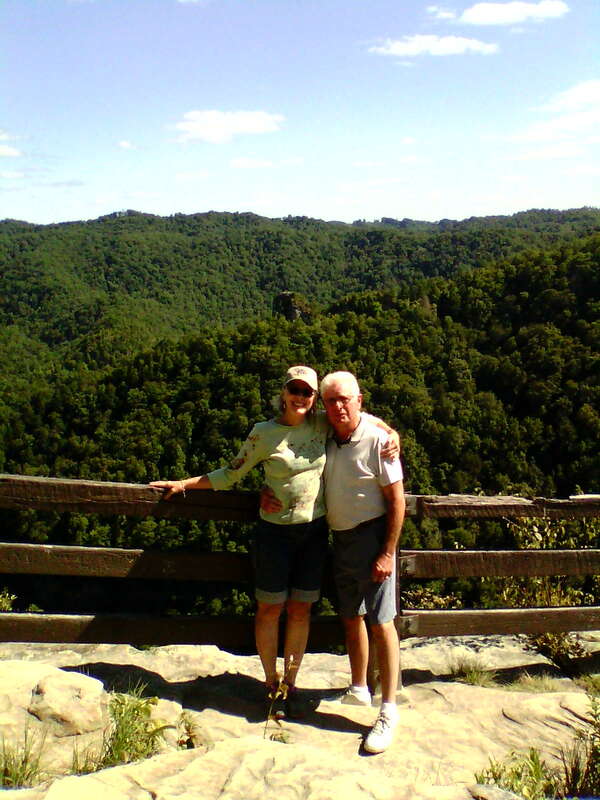 Since the dawn of my empty nest, I’ve traveled home to Kentucky and back every summer. I've coveted this time alone—until last year. During my return, I fought road fatigue and determined it’s dangerous to drive solo any longer. My husband took the wheel two weeks ago. As he turned onto I75’s detour, WRCJ featured the Beatles Concerto composed by John Rutter. “Isn’t that Long and Winding Road?” he asked. The words of John Lennon and Paul McCartney spoke of our youth before and when we met, our unsettled college days and as newlyweds. We moved our firstborn daughter and residence six times the first year of our marriage. Mel turned off the expressway at a Cracker Barrel sign in Ohio. The man in the rocking chair means a meal of turnip greens, pinto beans, and corn bread—southern food at its best with the works: vinegar, chow-chow, and onions. The featured dessert was a S’More Brownie in keeping with the chain’s campfire theme. We postponed our dessert for the return trip. Oh, how pampered is the modern traveler. After breakfast the next morning with Uncle Tab and Aunt Alma Leigh in Lexington, Kentucky, we followed Uncle Tab to his garden. We sat poolside in the shade and strung half a bushel of beans. Afterward, we blanched and froze ten quarts. Really? Does this man ever rest? I picked up a hoe and learned again his meaning of “hoeing”: pull the blade aside a row of sprouted beans, banking the soil over the small weeds and trenching the soil to hold the rain. The following day, when we visited my Uncle Herm in the McCoy Bottom, I saw the same method of hoeing. We left his gardens with cucumbers, cantaloupe, and potatoes. 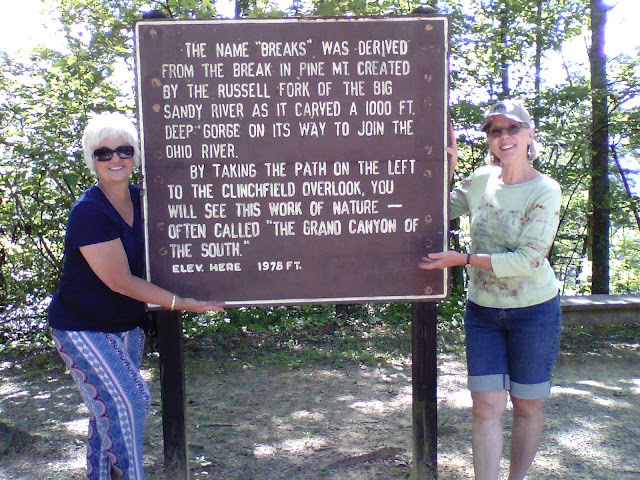 My sister Patty and I pose for a moment of education. 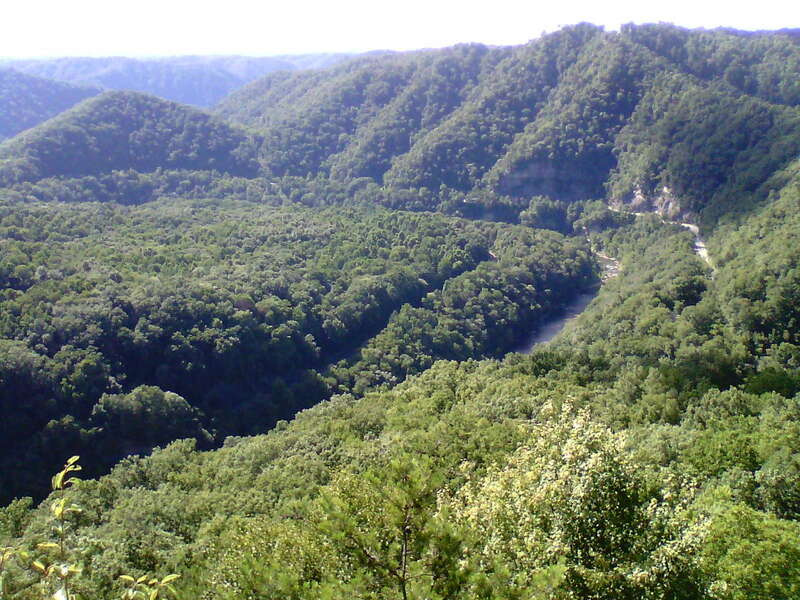 The last of my heart’s desire was to view again The Breaks forested canyon, the boundary between Virginia and Kentucky, and hike their mountain trails. 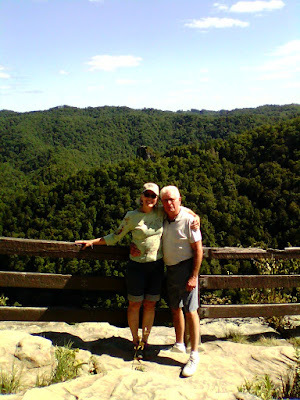 It had been years since I’d climbed through their rocky notches. As Mel led the way, my Kentucky sister, Patty, and I followed under the dark canopy alive with birdsong. When we reached the road, the wild child within and the native grounds about provoked the Tarzan yodel from my youth. "You've still got it," Patty said. We laughed when the forest emitted somewhat weaker attempts of Tarzan's call. Back to The Breaks and its birdsong. As Mel and I neared Detroit last evening on I75, WRCJ’s Jack Goggin introduced a song from Patrick Doyle’s soundtrack of Shakespeare’s Henry V released in November 1989. We sat spellbound as a lone voice led a song titled “Non Nobis, Domine.” Other male voices joined to a moving crescendo. For all the music during our travels, for our safe journey home, to Thy name give the glory.